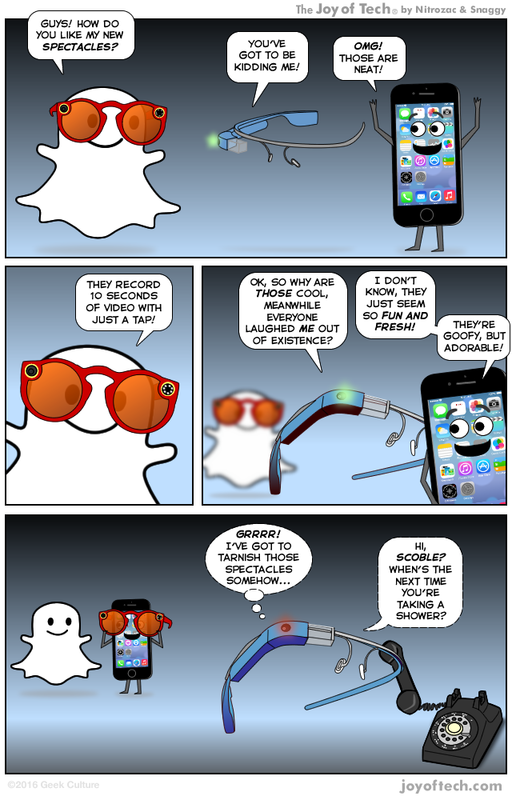 The Joy of Tech comic... Snapchat is making a spectacle of itself! What are your thoughts on cameras in glasses? Hated Google Glass, but Spectacles seems fun. Spectacles seems stupid, Google Glass more useful. Two cameras on my phone is enough, thank you. There's too many cameras already! Holding out for the in-eye, always on, retina camera, aka BORG. The Famous Druid says It's embarrassing how many of these people I know, ... dragonman askes about Apple TV, ... drunkennewfiemidget returns with What's the best way to stuff a turkey?, ... quantumfluff shows us How Amazon sees him, ... and Snaggy says We're trying Patreon, wish us luck! (They need it). 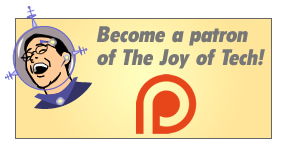 We've been making comics on the web since early 1999, and The Joy of Tech is now in its, whoa... 16th year.